I've been sewing for some time now and I have decided to challenge myself to sew all my wardrobe for a year. I will be hard for me because I'm a fashionista and a sucker for cheap fashion. So i came up with project #sewityourself. So what is so it yourself you might be asking? it was an idea that I came up with one day when I was really thinking about where our clothes come from and how they are made. I really wanted to know that I could create my own wardrobe and I wanted to stop the consumerism of buying too many clothes every single year. I was inspired a little by project 333 but I didn’t want to be super minimalist so this is my own twist. When I looked in my wardrobe it was full of stuff that I didn't need. It was a mixture of things that I had bought from cheap fashion outlets because it's so easy to buy a top that cost only £2. I made a promise to myself I'm going to sew my wardrobe for the year. I’m only going to buy things that I feel that I can't make or would be too expensive to make myself. Everything else will be made by me and I want you to come along on this journey join me with hashtag #sewityourself. so I can keep up with all of your exciting new projects I really want to see what you make as well and I would love to feature people on my Instagram on my blog who are also joining me with this challenge of making your own wardrobe. So I really want you to make it your own. Sewing doesn't have to be boring or old-fashioned. 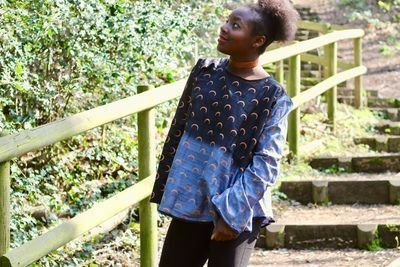 I think it's coming back into a trend when people are making their own clothes which I really love. check out my blog at http://www.chantellefashion.co.uk/ if you want to follow my journey and join me! I'm so excited to see all of your projects. What an amazing challenge, how is it going? I love that top! This is a great idea. I have been trying to be more aware of what I'm buying. I do tend to buy mainly from charity shops and other secondhand clothing outlets. I really like refashioning clothes and giving them a new lease of life. I'd love to learn how to sew my own clothes. Do you watch the sewing bee? I love seeing bee! been watching lots of old seasons of project runway too. Have you been watching the new season of project runway @EmilyCakes? I miss Tim I don’t think it’s quite the same without him. No, I haven't seen it in years. Which platform are you watching on? Ohh do you remember the British version, Project Catwalk with Kelly Osbourne? It was so good but it only lasted a couple of seasons. The old seasons are on Netflix (some of them) and I'm watching the new season on nowtv. We are a multi platform house! I can't remember if I watched project catwalk or not. So long ago! I think I did?